People often ask me: Tom, how do you manage to do so many projects? The answer is very simple: I love stitching on the train. My daily thirty-minute commute means I have at least one hour a day of crafting time, and I’ll have something to work on during lunch hour, too. However, there is a limit to what is manageable on the train. 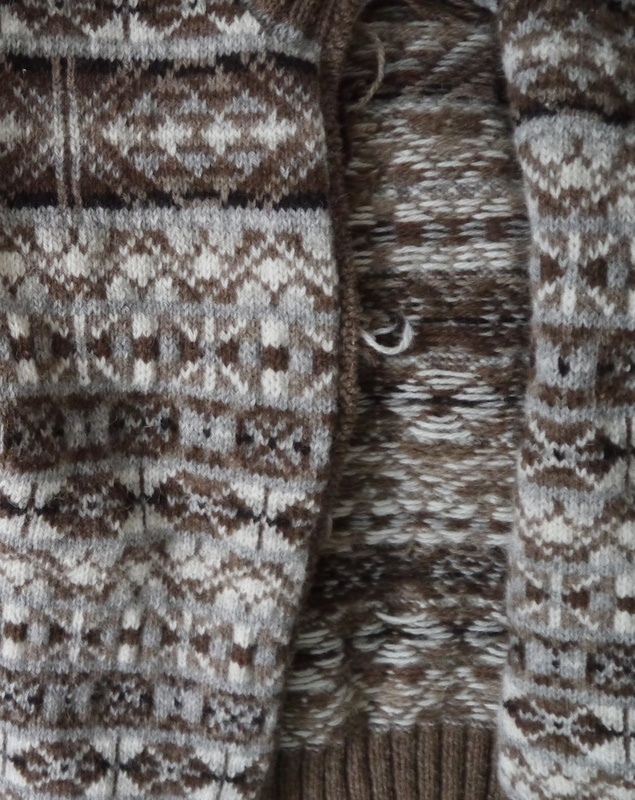 My Foula Cardigan is making good progress, which is great news, but it does mean it is now becoming somewhat unwieldy. So I have been looking for a smaller project to take on the train. When I met Sandra Manson and Martin Curtis during Wool House back in March, they asked me to work on some cushion covers, using Jamieson & Smith’s Heritage yarn. The Heritage yarn is a bit different from their regular jumper weight yarns: first of all, the colours are based on jumpers from the Shetland Museum and Archives collection. This means they are all flat colours, as opposed to the current trend of heathered shades. Secondly, the Heritage yarns are worsted spun. Therefore the yarn is smooth, and stronger than the woollen spun jumper weight yarns: perfect to indulge in a spot of embroidery. An easy project to take on the train, and it’s something I can do free-style. No need for patterns or charts to refer back to once in a while. No need to count stitches. 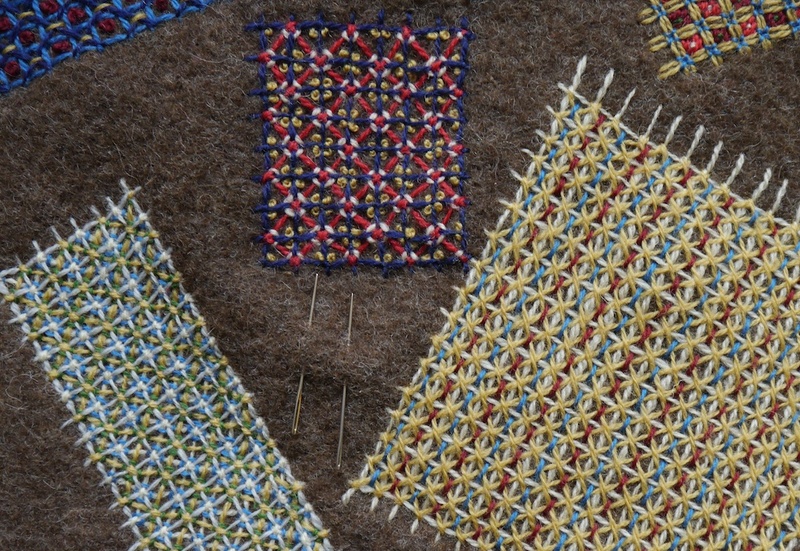 I couldn’t help but use a stitch which I have been using a lot in darning lately: Scotch darning, although there are some other names going round for this stitch, too. At work I have a scrap paper doodle pad, as I find that doodling helps me think through things, and often I end up incorporating words I hear, or numbers I see on my computer screen, and this habit is hard to supress. Indeed, I ended up stitching the lot numbers of the ball bands. Once you understand the principle, it is very easy to create your own variations. 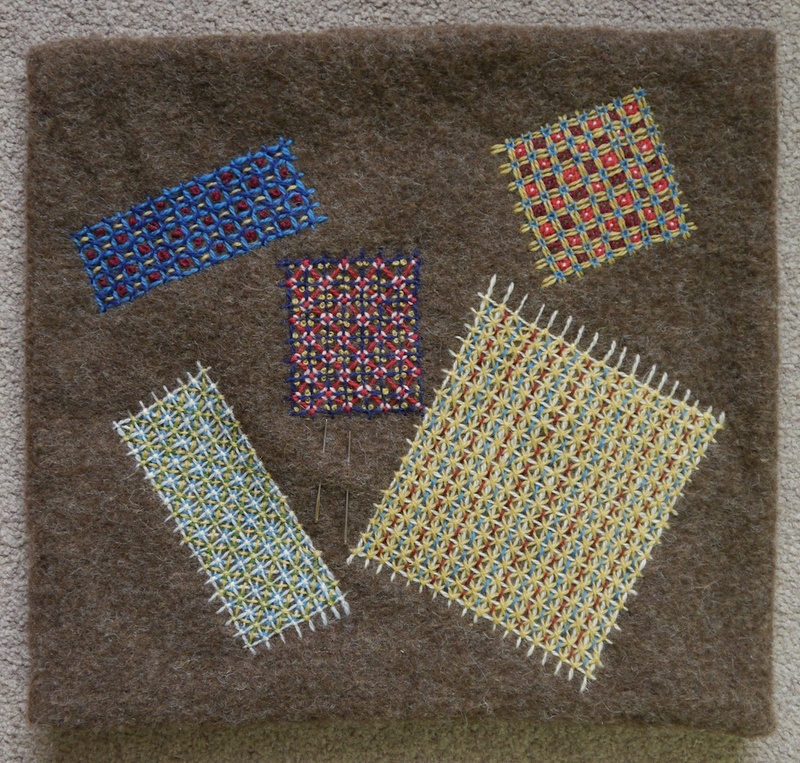 As the cushion cover fabric is very forgiving due to its thick, felted surface, it’s easy to try something and, if you don’t like it, to undo it again. No holes or other marks remain! I have made every patch free-handed. No measuring out or marking the fabric beforehand. This feels very natural, as my doodles are also often made up of grid-like structures that I fill in one way or another, and I relish the slight wonkiness this creates. To me it makes the rigid grids more alive. As you can see, the needles have not been put back in their needle case. I don’t think this cushion cover is quite finished yet. 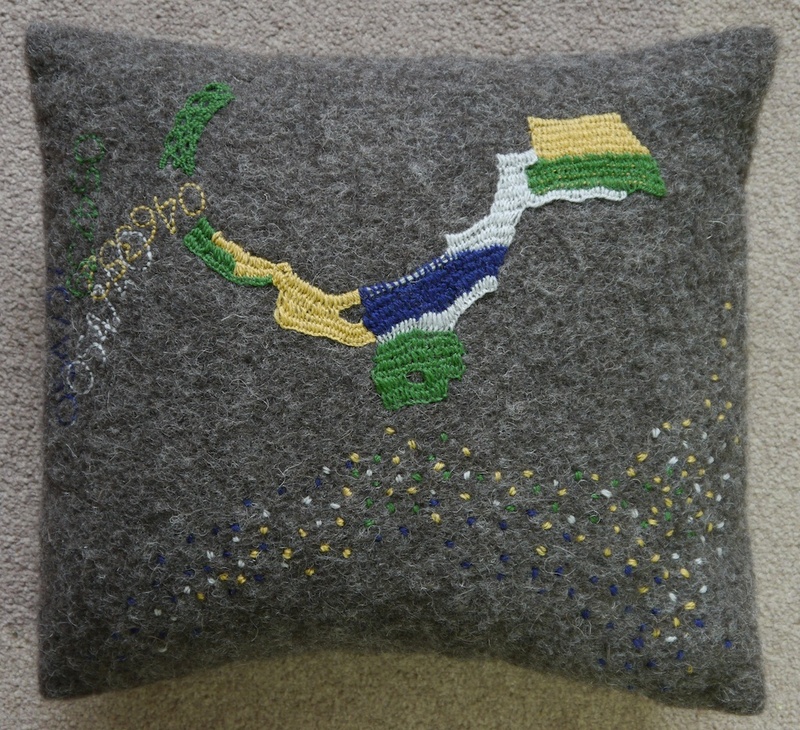 So keep an eye out on the train, you might see me stitching away, adding a last flourish to this cushion. Your cardigan looks wonderful, and the free-style embroidery is lovely. I agree – the train is a great place to knit! and excellent use of the time. I once took my cobweb shawl with me for a trip to London and back (I live in the north of Scotland) and I got so much done. It was also a talking point with other passengers. The above comment is very funny indeed! And I do like the embroidery very much. The background is a perfect foil for bright colours. thanks. I also knit wherever I can, public transport, at the pool when my children are having lessons, waiting in the car etc – the only way to get things done and a point of connection to others. Your work is beautiful. 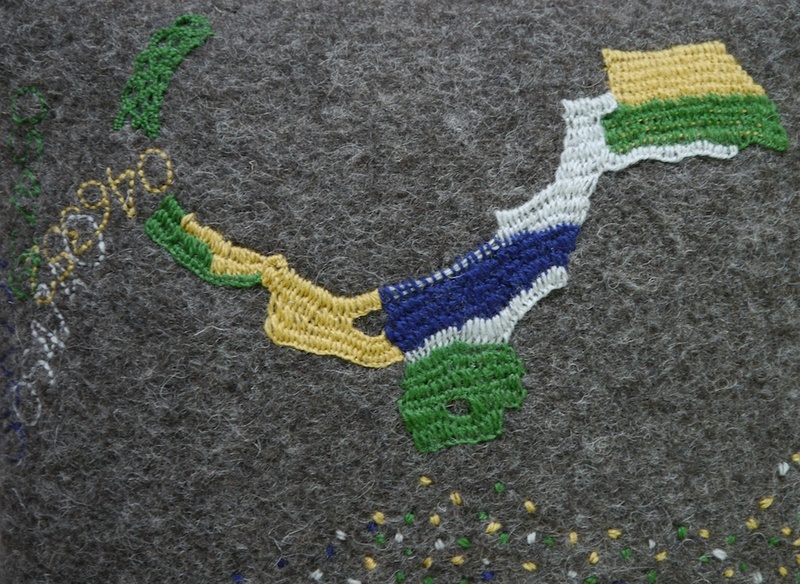 Love all your train embroidery. I too work on the train. I used to have an 1 3/4 hr journey there and back a couple of times a week. I would get so much done it was fantastic. Little old ladies love it and would always come up and chat to me. I knit on the bus and, when off to London for meetings, on the train. I knitted a Debbie Bliss dress for my daughter on the X13 bus in Oxford- certainly unweildly by the time i was near the end of the Fair Isle yoke. Pleased to see that Erica Wilson’s books are still inspiring – her tv shows in the 1970s were brilliant. I wonder if any survive and are on You Tube?